Last week the House Government Operations Committee took testimony on the bills. Kristin Shelley, MLA Legislative Committee Chair and MLA President-elect gave an excellent overview of why the bills are needed. She also provided a heart wrenching story of a death that occurred at a library where she worked years ago. The committee heard first hand how a life might have been saved if naloxone had been available then. Library of Michigan, the Michigan Department of Education and MLA have been working together to see this protection added for our libraries. In the United States, it is reported that a person dies of an opioid overdose every thirteen minutes. While they happen everywhere, it's been impossible to miss the stories of overdoses happening in the restrooms and parking lots of public libraries especially in New York, Philadelphia and Denver. There, librarians have administered life-saving Narcan on a weekly and sometimes daily basis. Unfortunately, libraries across the country have become a common site for opioid and heroin overdoses. Libraries throughout Michigan have been the sites of overdoses in recent years. Luckily in those cases, law enforcement officers responded quickly enough to administer Narcan before it was too late. Those libraries now train staff and stock the Narcan kits as do many libraries across the state. Libraries, however, do not have immunity for any liability situations that could arise from providing this life-saving treatment. As a result, library attorneys are often recommending that libraries not stock the treatment. These bills would allow libraries and library employees or agents to purchase, possess, distribute or administer in good faith an opioid antagonist without possible subject to criminal prosecution. The law would provide immunity to libraries similar to that provided to public schools. State Reps. and former teachers Darrin Camilleri (D-Brownstown Township) and Matt Koleszar (D-Plymouth), along with Rep. Kristy Pagan(D-Canton) introduced a package of bills aimed at addressing the state's ongoing literacy crisis by requiring staffed libraries in every public school in the state. The three bill package would ensure every student access not only to a school library, but to a certified librarian or media specialist trained to improve literacy, foster a love of learning, and help identify and correct problems before they become significant obstacles to reading. Governor Gretchen Whitmer proposed her 2020 budget. Library funding remains pretty much unchanged from 2019. This is step one in the budget process. Both the House and Senate will make their own recommendations. Any differences between the chambers are decided in conference committee. The proposed budget then heads back to the governor for her signature. The budget process gives us an opportunity to educate the new representatives about how libraries are funded. In the next few weeks MLA and GCSI begin a series of meeting with legislators. Recall that last year ago, we saw a $1 million boost in state aid to libraries. We hope to try to increase state aid again this year. Presentations to the House and Senate subcommittees overseeing our budgets will be scheduled soon. We will explain libraries' value to their communities, Michigan residents and their positive economic impact throughout the state. With dozens of new lawmakers in Lansing, it's important they learn about their local libraries from you now. Contact your representatives, invite them to the library for a tour, offer a space for their coffee hour. Explain to them how you help their constituency on a daily basis. There will be many organizations clambering for their time and attention. The sooner you can educate your representative about your library, the more likely they will support funding and other library specific initiatives. 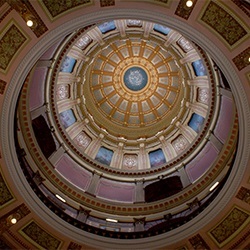 If you need contact information visit MLA's advocacy page. This Tax Tribunal bill would prevent tax tribunals from reducing the tax obligation of dark stores. This is similar to past bills that offer relief to local governmental entities suffering from an unfair reduction in taxes for big box stores. We don't know how quickly it will move. It depends on the opposition. We will monitor and assist where we can.